recently organised a one-day workshop on ‘Effective Management of Inter- Collegiate Tournaments’. Dr MRK Prasad, Principal of the College, was Chief Guest.Dr Devashish Bagchi of Chowgule College, Manoj Hede of Kare Law College Margao and Dr Jayesh Churi of Saraswat College Mapusa were the Coordinators for the same. A Consortium of College Director’s of Physical Education and sports of Goa comprising all affiliated colleges of Goa University was formed and drafted the need base proposal that will be shortly submitted to the University. 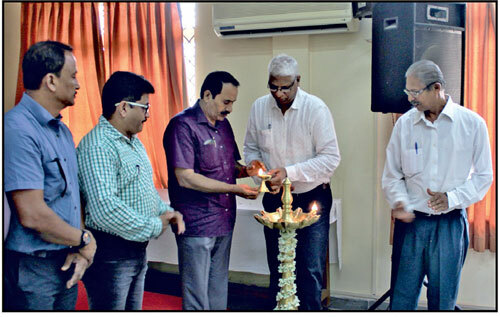 College Directors of Physical Education and Sports across Goa participated in the interactive sessions and gave various suggestions in uplifting the sports participation and sports event standards of Goa University. The consortium also discussed and proposed full support to Goa University in working together in providing best possible facilities to the sportsmen taking part in Intercollegiate and Inter Varsity tournaments. The gathering also discussed possibilities of providing post graduation and research degrees in Physical Education and Sports Sciences to aspiring Goan students and faculties who otherwise have to pursue the same in other state of India.